2) The Conservative share of the seats will still drop most dramatically; the last time these were contested in the dog days of Gordon Brown’s premiership the Tories trounced Labour. So how well might they do? A ComRes Poll for The Coalition for Marriage released on Tuesday night suggested that UKIP could win a staggering 22% of the vote. The same poll put the Conservatives on 31%, Labour on 24% and the Lib Dems on 12%. Of course this is just one poll, but if UKIP do well at all they could seriously increase the number of seats the Conservatives lose. As our Election Analyst Colin Rallings has said, the Tories are in line to lose more than 300 seats. More than 400 losses and David Cameron will have had a very bad night. There was a time when it was thought that might have threatened his leadership, although there seems to be less of that kind of talk around now. 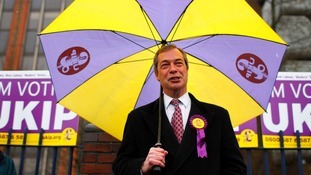 This is not to say UKIP will actually win a lot of seats. Their evenly spread support may just mean they contribute to Tory losses rather than making very large gains in their own right. But a good showing for them would mark another step on the road towards UKIP becoming a new force in British politics, suggesting the next General Election will be fought not between three main parties but between four. ITV News elections analyst Professor Colin Rallings says Labour will make gains in the local elections, but there will be surprises too.